Floyd J. Malveaux is a microbiologist, physician, and educator. Floyd J. Malveaux, M.D., Ph.D., is executive director of the Merck Childhood Asthma Network, Inc. (MCAN). Dr. Malveaux is a nationally recognized expert on asthma and allergic diseases and is emeritus dean of the College of Medicine and professor of microbiology and medicine at Howard University. Dr. Malveaux led Howard’s participation in several multi-million dollar initiatives to identify and address risk factors that contribute to increased deaths from asthma among inner-city children and to reduce and prevent asthma among at-risk populations. In addition, he has worked extensively to address health disparities and improve the quality of health care and health outcomes, especially among low-income, urban, and underserved populations. A native of Louisiana, Dr. Malveaux received a B.S. degree from Creighton University in Omaha, Nebraska, and an M.S. from Loyola University in New Orleans. He earned a Ph.D. in microbiology and public health from Michigan State University and a doctor of medicine degree, with honors, from Howard University College of Medicine. Dr. Malveaux received specialty training in internal medicine at the Washington Hospital Center in the District of Columbia and subspecialty training in allergy and clinical immunology at the John Hopkins University in Baltimore. He returned in 1978 to the Department of Medicine at Howard University and established the Conjoint Training Program in Allergy and Immunology. In 1984, he joined the faculty of Johns Hopkins University where he initiated studies on asthma mortality and morbidity. Dr. Malveaux returned to Howard University in 1989 as chairman of the Department of Microbiology and associate professor of microbiology and medicine. 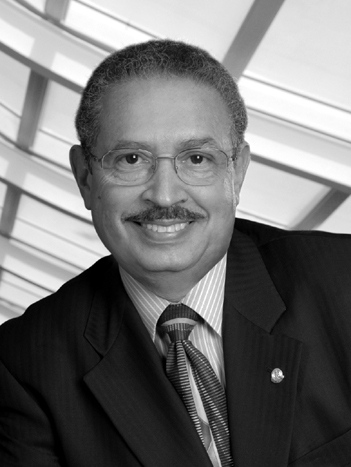 He became dean of the Howard University College of Medicine in 1995 and served in that capacity until 2005. During that period, he also held positions as interim vice president and vice provost for health affairs and as professor of microbiology and medicine. He has served on the Science Advisory Board of the U.S. Environmental Protection Agency since 2009. Dr. Malveaux is a fellow of the American College of Physicians and the American Academy of Allergy, Asthma and Immunology. He is a member of Alpha Omega Alpha Honor Medical Society and was elected to the Institute of Medicine (as of July 1, 2015, the National Academy of Medicine). He is active in numerous professional organizations and serves on the boards of a number of institutions. Dr. Malveaux has held several positions with the National Medical Association, including being a member of the Board of Trustees (1988 1994) and was first chair of the Allergy/Immunology Section. Dr. Malveaux was founder and president of the Urban Asthma and Allergy Center in Baltimore from 1986 to 1989. Dr. Malveaux is the recipient of numerous awards from institutions including the National Institutes of Health, the Vivian B. Allen Foundation, the Georgetown School of Medicine, Howard University, the Howard University Hospital, and the Institute for the Advancement of Multicultural and Minority Medicine.